Golden Labradorite Meaning and Uses: Golden Labradorite, also known as Yellow Labradorite, is a stone that helps balance your energy and harness your personal power. It is a masculine stone, and as it’s bright, yellow color suggests, its energy has a solar tone, hence why it’s often called the Sunstone. 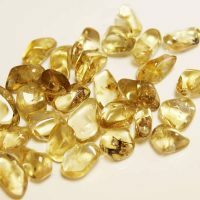 Golden Labradorite Properties and Benefits: Spiritually Golden Labradorite is associated with the Solar Plexus chakra. It represents the solar qualities of Labradorite – inner strength, vitality, clear thinking, endurance, spiritual focus and purposefulness. It can calm the emotions through increased clarity of mind, and it can help one see the Divine pattern in one’s daily struggles. Golden Labradorite takes one not only into communion with the energies of our own sun, but through a thread of light connects one with the Greater Central Sun, the home and origin of consciousness in the Universe. Hence, it is wonderful to use whilst meditating. As said Golden Labradorite’s energies are male in tone and solar thus it can be used to activate the male aspects of the self. It is supportive in the traits of extroversion, self confidence, creativity, self-expression in language, assertiveness and physical activity. For those that feel tentative, unfocused, passive or weak, Golden Labradorite can be a handy ally. In on the physical level, Golden Labradorite assist with issues of the kidneys, gallbladder and spleen. It helps purify the body’s purification systems by aiding in detoxifying the organs responsible for this process. However, do keep in mind that this information is not a substitute for medical advice. Consult your doctor before engaging in crystal healing and therapy. Golden Labradorite Facts: Golden Labradorite is often found in Mexico, China, and the United States, among other places.